The founder of Shoma Group, the builder of over 10,000 homes, sounds off on the changing landscape of development in South Florida … and his favorite clothiers. It may be hard to believe that the man who today oversees a vast empire of real estate development in South Florida, who relishes the riches of his success — driving a Rolls-Royce Wraith and sporting the latest fashions from Bijan and Dior — was once a frightened 18-year-old, completely alone in the U.S. as a freshman at the University of Miami, in exile from his home country, where a revolution was just beginning. But Masoud Shojaee was once that kid. Supplied with seed money from his father, who was a developer in their native Iran, Shojaee began his career in building well before he turned 30. Today his firm, Shoma Group, develops apartment buildings, townhomes, office buildings and retail space in addition to the 10,000 single-family homes it has built since he founded the company in 1988. The 57-year-old founder’s joie de vivre is as notable as the scale of his firm’s productivity. While friends note his generous character and sartorial sensibility, they’re just as apt to muse about his determination and focus in business. The Coral Gables resident told The Real Deal that his goal is to bring new design concepts to the region — like choosing a minimalistic style rather than Mediterranean architecture at the nearly completed Oasis at Park Square in Doral, where each unit features a private rooftop with a Jacuzzi, barbecue area, bathroom and covered terrace. “If you create something like this, you are separating yourself from competitors,” he said. Shojaee’s ability to adapt to the changing conditions of the market is among the keys to his success. He started his career with a focus on single-family homes because they offer more flexibility: If the market takes a turn, you can switch plans. And as conditions have shifted toward the end of this cycle, Shojaee, too, is changing tack by shifting to multifamily projects. “It is great cash flow and you have no risk, and you sell the building when it’s stabilized, or you decide to keep it, and two or three years from now, when the condo market is great, you do a condo conversion,” Shojaee said. Although he has completed dozens of successful projects — as many as 10 at a time — Shojaee has also had his share of struggles and lawsuits. There was a failed hotel development plan in Las Vegas — a deal that collapsed in 2007 along with the economy. And he is currently in the midst of litigation against Ugo Colombo, his partner on the planned Collection Residences. There’s also a suit against Colombo’s exotic-car dealership, the Collection, related to a $413,108 contract to purchase a Ferrari. On top of those, there’s the developer’s lengthy divorce that began when his wife, Maria Shojaee, filed in April 2015 after 29 years of marriage. Their former home, a Moroccan estate in Coral Estates, is on the market for $12.95 million. Both Shojaee and Colombo declined to comment on the legal wranglings. Shoma still owns 50 percent of the property planned for the Collection Residences. Andrew Hall, Shojaee’s friend and managing partner at Hall, Lamb, Hall & Leto, who represents him in the Collection Residences and Collection suits, said litigation is par for the course. “Every major business person I have ever known has some degree of litigation associated with them, and it doesn’t mean they haven’t been successful,” Hall said. Shojaee’s aptitude for building is in his blood. Shojaee was born in Tehran, Iran, where his father had a large construction company that worked on government projects and employed 400 engineers. Amid strikes and brewing unrest, Shojaee left home in August 1978 to study electrical engineering at the University of Miami. Four months later, the Iranian revolution began. Businesses shut down. He couldn’t return to Iran. His father retired and Shojaee’s life took a turn. He was on his own to continue his studies, earning a master’s degree in electrical engineering and taking additional classes, aiming for a Ph.D. in the subject. He’d brought capital with him from Iran, and his family had sent more money to invest in the United States — an amount Shojaee will only peg as “millions” of dollars. While other friends of his with similar nest eggs wasted the money or partied it away, Shojaee used the funds to launch his career. It was the mid-1980s, during the savings and loan crisis, “a good time to start looking for properties,” Shojaee recalled. His first project, when he was 24, was a 48-home development in Kendall, called Kendall Best 2, in a joint venture with an experienced partner, Ernestino Abreu, principal of a family business, A & F Developer. The deal was that Shojaee would put up all the equity, and bank financing would provide the rest of the funds. That led to a second, 58-lot project, Kendall Best 3, also with Abreu. After its successful sell-out, Shojaee decided he was ready to strike out on his own. So in 1988, at 27, he started Shoma Development with 10 employees. Abreu had partnered with the Somoza family of Nicaragua to develop hundreds of lots at Sunset Harbour, at Sunset Drive and 127th Avenue, and was ready to cash out. Shojaee bought Abreu’s share in the partnership for “a few million” dollars — a number he doesn’t recall exactly — taking on more than 200 lots to build single-family homes. The next deal was even larger. Shojaee purchased 237 lots on Northwest 6th Street and 132nd Avenue for nearly $9 million, and developed homes on the property. Then in 1992, he bid $6 million in a government auction of 700 lots and negotiated a deal to get 300 more, developing 1,000 single-family homes on 220 acres, called Tamiami 4 and Tamiami 5. Shojaee’s strategy was to focus on the Hispanic market, advertising the homes on Spanish radio by broadcasting a live breakfast show from the sales office. “That was one of the most successful projects I did,” he said. “Every [other] builder was selling maybe five units a month if they were doing really well, and I was selling somewhere from 20 to 30 homes a month in that location.” Prices ranged from $150,000 to $330,000 per home. For Shoma’s single-family developments, Shojaee said the company handles 80 percent of the design, 100 percent of the construction and 90 percent of sales. That reduces costs, provides more control, and allows the company to establish relationships with buyers, he said. Shoma Group recently renovated its headquarters at 201 Sevilla Avenue in Coral Gables. During his earlier years, Shojaee said he was primarily focused on mid-market prices for single-family houses and townhomes, but he changed direction after the housing crisis of 2007, opting to build more luxury homes and townhomes priced at $1 million and up. “We saw more of a trend that [buyers] are willing to pay more money and want a different product, so we changed to that,” he said. But as Shojaee expanded into residential development in Broward and Palm Beach counties, in addition to office development, he needed a way to keep an eye on his many projects. When he renovated an office building in the Waterford office park, he used a helipad to board one of his two helicopters, in which he flies over and observes his projects across South Florida every day. For Steve Patterson, president and CEO of Related Development, Shojaee’s vigilance is one of the keys to his success. “He has an enormous sense of urgency with everything he does, and that is why he gets so much done,” Patterson said. Shojaee even got into the aviation business in 2003, buying and selling planes and helicopters. In 2008, amid the downturn, he sold all the inventory for more than $150 million, he said. He reentered the aviation business two years ago, buying and selling more planes. He recently sold two Challengers and currently owns a Challenger 604 for his corporate use. Shoma remains busy, working on six projects, planning four more and looking at single-family home construction in the Boca Raton area and Delray Beach. Most recently, the firm partnered with the Related Group on CityPlace Doral, a mixed-use project. Shoma is also finishing developing the homes at Oasis at Park Square at CityPlace. In addition, in Coral Gables, Shoma has built custom homes and townhomes and recently renovated the company’s new headquarters at 201 Sevilla Avenue, where Shojaee works with his two daughters, Anelise, 31, and Lilibet, 28. Shojaee is also planning to build 180 apartments and 50,000 square feet of retail space at 1515 San Remo Avenue, across from the Shops at Sunset Place. In Miami Beach, Shoma is planning a luxury townhome project, Eleven on Lenox, with construction expected to begin in the first quarter of 2018. The three-story units will feature rooftop Jacuzzis and barbecues. “There’s a certain flair to Masoud that is undeniable. It’s enjoyable. He’s respectful and firm and he knows what he wants and is relentless in getting it,” Parker said. Shojaee also knows exactly what he wants from a sartorial perspective. 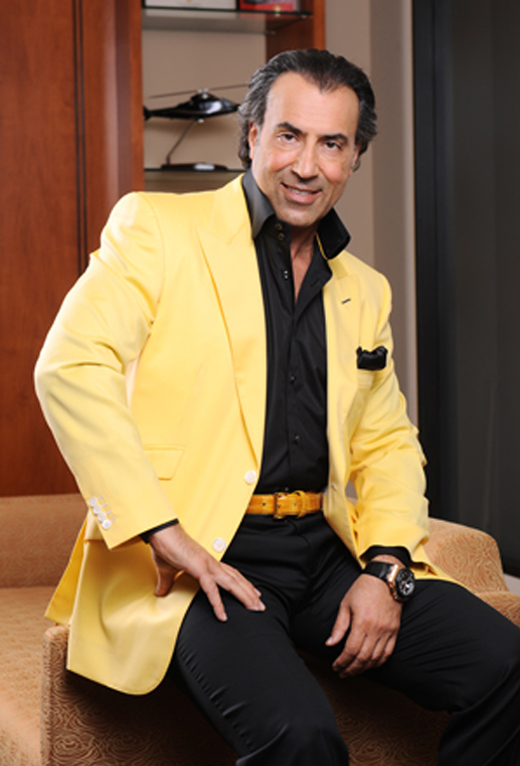 He visits Bijan on Rodeo Drive in Beverly Hills every quarter and has suits designed with unusual twists like a yellow jacket with one black button and all the rest white buttons. Shojaee’s personal style may also translate into adding a scarf, or eschewing the custom of choosing a belt and shoes of the same color, and instead matching the jacket color with the belt, and opting for a different color in shoes. A food and wine aficionado, he’s amassed a 2,500-bottle wine cellar, which includes about 20 bottles of Petrus Bordeaux. As a frequent flyer, Shojaee also keeps an apartment in Montreal and makes regular visits to family in Paris. Those who know Shojaee also call him a generous friend. Hall said Shojaee and he have a group of “highly accomplished” mutual friends, including high-profile attorney Scott Baena and others he declined to name. The group regularly gets together socially for dinner, each taking turns hosting. Hall said that when it was Shojaee’s turn last fall, he flew eight people on his private plane on an excursion to Austin, Texas, for a lunch and dinner of brisket and ribs. As much as Shojaee relishes such leisure, he said he hopes to keep working for another 20 years.